The Musical Rainbow Story is about learning to play the Happy Birthday song with your child in a fun, efficient and straightforward manner. How does Peter learn to play the Happy Birthday song for his friend Suzy’s party when he can’t read the music notes? 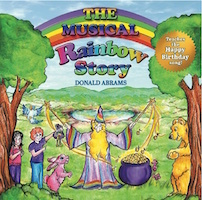 Author/Musician Donald Abrams shows us how Peter learned to play the song in the telling of this delightful children’s musical adventure tale that takes us to the end of the rainbow. We all know what’s there! Find out who else shares Peter’s quest, and the special character that appears to help save the day and make the birthday party a big success! With clearly explained musical graphics, and an online video demonstration as a visual guide, this book leads you safely along so that your child can have their first musical experience playing the most well-known song of all time. “Happy Birthday To You”. If you need a keyboard to play the Happy Birthday song, go to www.virtualpiano.net, where you'll find a really nice free online piano that you and your child can play with a mouse or the hotkeys on your computer, laptop, tablet, or smartphone. 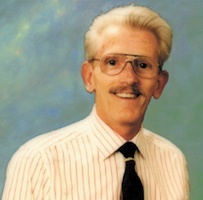 Donald Abrams, BS, Music Therapy, S.U.N.Y. New Paltz (1980) has authored a children’s book for those who wish to use music as a bonding point with a child. Read his book together and find out the solution to playing the Happy Birthday song! You’ll have fun like Peter & Suzy!